Where did Yankees’ outfielder and home run slugger Aaron Judge go yesterday after becoming the first rookie to get 100 walks in a season since 1953? 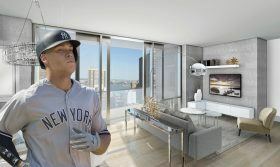 Quite possibly to his pad at the glassy new rental 237 East 34th Street. 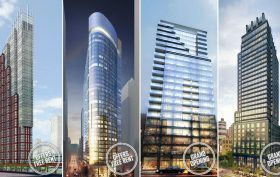 A source told The Real Deal that “the Judgement” recently rented a penthouse at the Murray Hill building, and the latest such unit to go off the market is a $13,900/month duplex with two private terraces, a large open kitchen/living room plan, and East River and skyline views.